* FSU President’s List (Spring 2013, Spring 2014). * FSU Dean’s List (Fall 2012, Fall 2013). * ACC Academic Honor Roll (2012-13, 2013-14). * Made 11 appearances in her first full season with the Seminoles. * Played a season-high 38 minutes in the NCAA Tournament Third Round against Colorado. * First career shot came against the Buffaloes in the NCAA Tournament. * Saw action in eight of FSU’s nine postseason games including all three matches in the ACC Tournament and in the first five games in the NCAA Tournament. 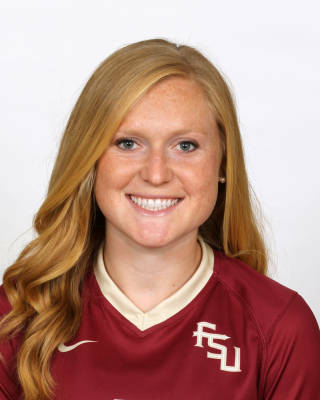 * Made her Seminole debut in the second game of the season at home against Auburn tallying 15 minutes on the pitch in FSU’s 4-1 victory. * Recorded double-digit minutes on the pitch in eight of those 11 matches including four games in the NCAA Tournament – South Alabama, Ole Miss, Colorado and Boston College. * Redshirted the 2012 season. * Helped lead George Jenkins to the 5A state finals as a freshman, 5A state semifinals as a sophomore, 5A regional finals as a junior and 4A state finals as a senior. * Garnered first team all-county and first team all-state accolades in each of her four years at George Jenkins as a defender (2009-12). * Named Polk County Player of the Year in 2010 & 2012. * Earned team MVP honors as a junior and senior in 2011 & 2012. * Two-year team captain (2011 & 2012). * Also competed in volleyball and track and field…two-time first team all-county honoree in volleyball (2010 & 2011) and three-time first team all-county honoree in track and field (2009, 2010 & 2011). * Placed eighth at the 4A state championships in the triple jump in 2011…named volleyball Defensive Player of the Year in 2010 & 2011. * Graduated with honors and ranked 14th in her class, while achieving above a 4.0 GPA all four years. * Member of the National Honor Society, Key Club and Fellowship of Christian Athletes. * Recipient of the 100+ Community Service Hours Award. * Played with the Lakeland Futbol Club. * Member of the ODP state team in 2008 & 2010. * Daughter of Glenn and Karyn Scarpa. * Father Glenn played baseball at Florida Southern College, mom Karyn is a world champion barefoot water skier. * Majoring in exercise science.